Every once in a while I see the birds standing in the cracks of the Kotel pecking one another. One bird stands there turning its neck or its face to the other bird and the second bird pecks it over and over again. It can go on for several minutes. What's going on? The bird that is pecking is pecking at the tiny bugs that are biting the other bird. Obviously, the bird being pecked loves what the pecking bird is doing. 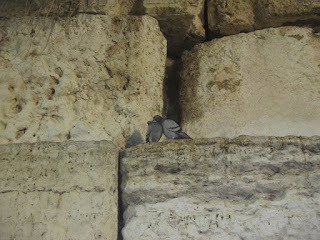 But the other day I overheard them arguing which one of them was doing the mitzvah of "ahavas bird k'mocha" (love your fellow bird like yourself). The pecking bird says, "I am doing the mitzvah because I am relieving you of those miserable bugs that are biting you, so you should be very thankful to me. You cannot get rid of them by yourself." And the bird being pecked says, "I am thankful for what you are doing but I am doing the mitzvah of feeding my fellow bird which is a tremendous mitzvah. You aren't pecking me because of your love for me. You are pecking me because of your love of bugs for lunch." And back and forth they argue as to which one is really doing the greater mitzvah. The same debate could be said by a Jew giving tzedakah (charity) and the Jew he or she is giving to. The rich Jew says, "I am doing the wonderful mitzvah of giving tzedakah to my fellow Jew so obviously I am the one doing the mitzvah here. You are just receiving money from me and are doing nothing!" While the poor Jew who receives the tzedakah could say, "If I wasn't here you would not be able to do the mitzvah and all you would have is a few more coins in your pocket, coins that you don't even need. But since I am here and needy, those few coins that you give to me will not only do good for me when I spend them, but they will come back to you later in Heaven… only then, they will be made out of a wondrous, uplifting, brilliant light." When a bird pecks its fellow bird both birds benefit tremendously. One bird gets instant relief from the itchy bugs it can't reach while the other bird gets its delicious lunch. All he has to do is peck it up. When a Jew gives another Jew well needed charity both Jews benefit. One Jew gets lunch while the other Jew gets a guaranteed spiritual inheritance to be delivered to him later when he goes to Heaven. Two win/win situations. It's called preening. When a bird gets a new feather there is a Shaft around it making the head uncomfortable. It's hard for the bird to preen its own head!!! so another bird gets the job. There is protein in the shaff so it is beneficial to the bird doing The preening.